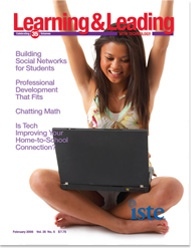 ISTE (the International Society for Technology in Education) has posted a feature article from the February/March issue of Learning and Leading with Technology entitled "Social Networking for the K-12 Set," written by yours truly. In the article, I discuss the potential of social networking tools, the development of the SUSD Teacher and Student Community sites, (you're in the SUSD Teacher Community site now,) and the impact that their use has had on our education environment. For more information on open technologies, visit the CoSN Open Technologies Initiative web site at http://k12opentech.org. There you will find a wealth of relevant information for K-20 educators on open-source, open standards, and open content.